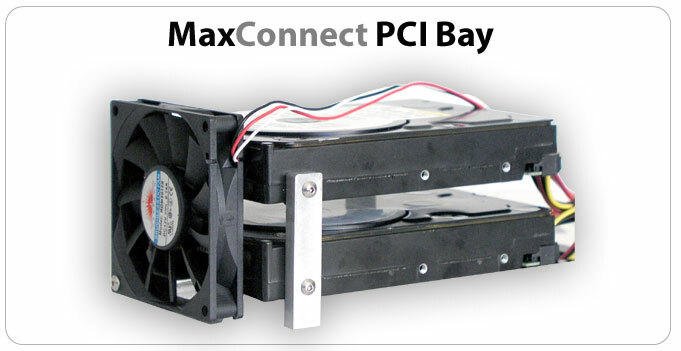 MaxUpgrades offers MaxConnect PCI Bay internal storage expansion assembly for G5 Power Macs. MaxConnect PCI Bay enable two additional hard disk drives to be mounted in the PCI Bay of G5 Power Macs. MaxConnect PCI Bay assembly is made of Aluminum. MaxConnect PCI Bay assembly when used with MaxConnect CPU Bay mounting assembly for three SATA disk drives , a total of seven disk drives can be installed inside Power Macintosh G5, this will enable the user to set up RAID 5 inside Power Macintosh G5 with five SATA Hard Disk Drive along with a seperate boot drive.